A dreadful situation has arisen in the country today where age-old human values are suppressed. A selfish group of people betrays any one or anything for the sake of financial and other personal gain. 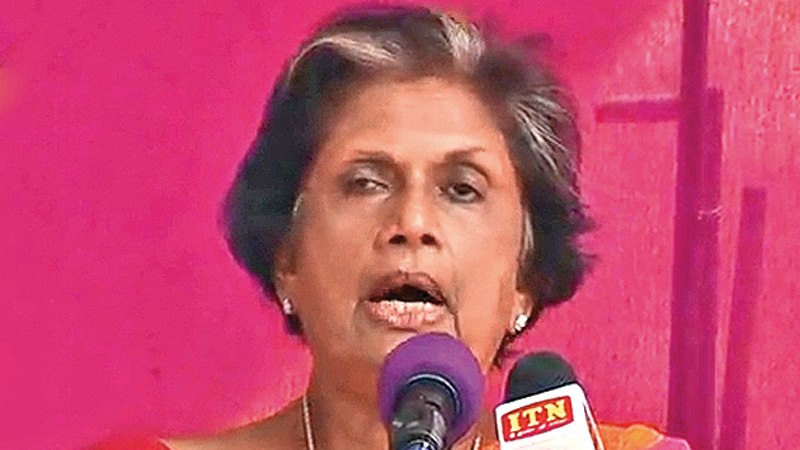 Certain politicians too fall into this category, Former President Chandrika Bandaranaike Kumaratunga said. The former President was addressing as the chief guest the gathering at the prize distribution of an arts festival at the Orchardwatta Vidyalaya, Horagolla, Nittambuwa recently to mark its 25th anniversary. Kumaratunga said she offered a prominent place to develop education during her period of office. She sat down with the Education Minister day in and day out to introduce educational reforms in the country which helped create a significant progress in the education field, she said. "Nearly 700 schools were upgraded as Navodaya schools, two schools from each DS Division. They could not touch the schools in the north and east because of the war situation. Permanent principals were appointed to schools where there were no principals. Principals and teachers clamouring for transfers to Colombo and other congenial stations were retained in the uncongenial stations by offering them higher salaries and other facilities," Kumaratunga said. "The reorganisation scheme was stalled halfway due to the change of then government. Now steps were being taken to reintroduce those reforms. Every effort would be taken to develop the five Navodaya schools and other schools in Attanagalla, so that students in the area need not clamour for Colombo schools any more," the former President said. Eastern Provincial Council Education Minister Ranjith Somawansa, and Parliamentarian Harshana Rajakaruna were present.